It is the priority of all our staff to make your visit to our office friendly, courteous, and pleasant. We take pride in serving and caring about you, our patients. We want you to remember our smiles long after you forget your pain! I am a second generation Chiropractor to the area. I attended Fort Myers High School, Edison College for a portion of my pre-med, Florida State University for a portion of my pre-med, and Life Chiropractic College in Marietta, Georgia where I obtained my Doctorate Degree in Chiropractic. I practiced for 5 years in the area surrounding Atlanta, GA, and then moved back to southwest Florida to be closer to my family. I have practiced in the Fort Myers local since 1997. I have enjoyed raising my family here in my hometown of Fort Myers, Florida. My approach to Chiropractic Care is to first listen well to the patient’s needs, and note their issues. Sometimes doctors can disconnect from their patients and become absorbed with the operation of their practice, and don’t listen as well. I want to understand what my patient is going through. I have personally experienced migraine headaches, whiplash, and sciatica and therefore can relate to the patients suffering. This experience helps me to diagnose what their issues are and what would work best for their condition. So, as a Doctor and a member of the community I understand there are many choices for Chiropractic Care and health care in general. It is an honor when patients choose our office for their Chiropractic needs. We love to give our patients the highest quality care. We provide massage, electrical stimulation, ultrasound, and other therapies to compliment their treatment care for a conservative approach to their health. Dr. Sam (Uncle) Dr. Sam Watkins joined Dr. Rob several years ago to serve as a covering physician to our Ft. Myers and LaBelle patients. 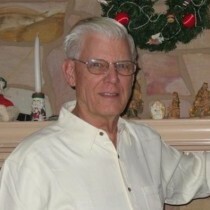 Dr. Sam brings more than 50 years of experience to the practice. 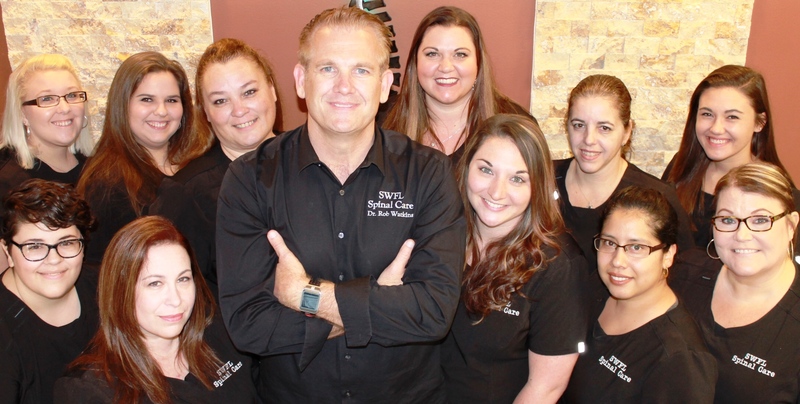 He has practiced all these years in the Downtown Fort Myers area as well and mentored several chiropractors in our area. Kim keeps the Fort Myers and LaBelle offices running smoothly by serving as the Practice Manager. Kim is responsible for organizing and coordinating office operations and procedures in order to ensure organizational effectiveness and efficiency. 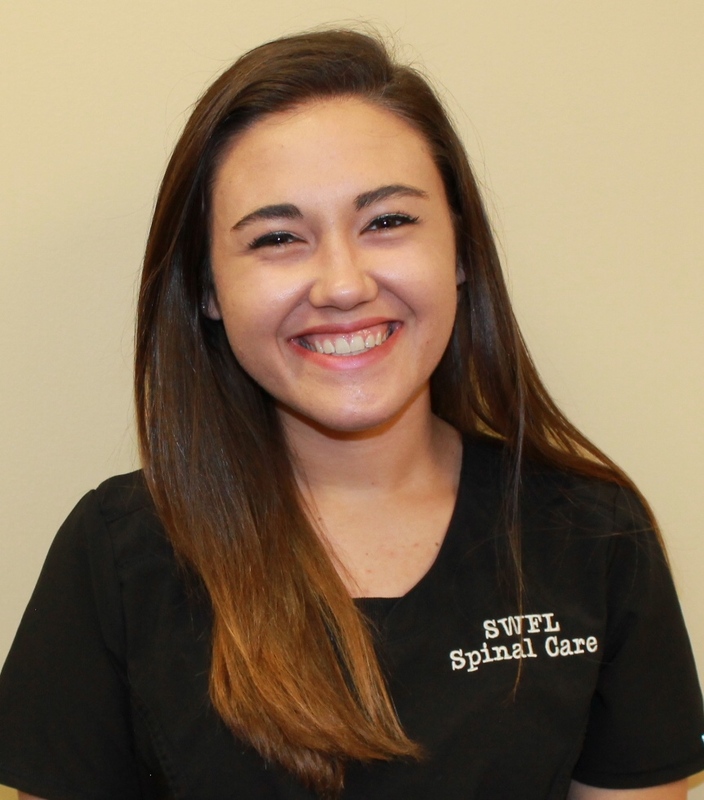 She is always ready to answer any questions and assist in providing a pleasant chiropractic experience for each patient at SWFL Spinal Care. Gina assists Dr. Watkins in taking medical histories, recording vital signs, preparing patients for examination, and assisting Dr. Watkins during the examination. She is a Registered Chiropractic Assistant and is fully trained in many areas of our chiropractic practice. She is an efficient employee that is often found jumping up to lend a helping hand in any department that needs assistance. Gina is currently working on her BA in Nursing to become a travelling nurse. Marnie is our Billing & Insurance manager in our Ft. Myers chiropractic office. She compiles and submits claims to insurance companies and then subsequently bills patients. We greatly appreciate her patience and sweet spirit when dealing with sometimes rather difficult claims inquiries. She is a Registered Chiropractic Assistant, and also known to help out with therapies on occasion. Danielle is a Registered Chiropractic Assistant and assist with therapies in our Fort Myers office. Additionally she serves in our Billing & Insurance department in our Ft. Myers chiropractic office as well as our LaBelle chiropractic office. She assists with admin responsibilities, and can be found assisting Dr. Watkins with patients or helping out at the front desk. She is happy to help you understand your insurance benefits or assist you with any billing questions you might have. She is a Registered Chiropractic Assistant, and assist with therapies. Tatiana is a Licensed Massage Therapist and a Registered Chiropractic Assistant in our Fort Myers chiropractic office. She offers 30 and 60 minute massage sessions 5 days per week. She may perform your physiotherapy as well. Tatiana methodically applies focused, hands-on techniques to promote relaxation and increase circulation in the body’s soft tissues (muscles, tendons, connective tissue, etc.). Call to check availability and schedule your relaxing massage today. Nancy is a Licensed Massage Therapist and a Registered Chiropractic Assistant in our LaBelle chiropracic & Fort Myers chiropractic offices. She offers 30 and 60 minute massage sessions on Monday and Thursday afternoons in LaBelle and Wednesday and Friday afternoons in Fort Myers. She pays special attention to alleviate the source of the pain through cycles of isolated pressure and release. The recipient actively participates through deep breathing as well as identifying the exact location and intensity of the discomfort. Call to check availability and schedule your relaxing massage today. Robin is the smiling face you will see as you arrive and leave our Fort Myers chiropractic office. She is our First Impressions and Front Dest Manager. Her humorous and friendly demeanor is so welcoming and she will keep you coming back for more! She is glad to answer your call or make you an appointment. She is a Registered Chiropractic Assistant in our Fort Myers chiropractic office. She also helps administer ultrasound and electrical stimulation therapies. Shauna is a Registered Chiropractic Assistant in our Ft. Myers chiropractic office. She assists Dr. Rob Watkins in taking medical notes, recording vital signs, and helps to maintain our medical records. She is also skilled in ultrasound and electrical stimulation therapies. Shauna is excited to have this experience in a chiropractic office. She is currently working on her BA degree in Nursing to become a nurse anesthetist. Sarah is our LaBelle chiropractic receptionist. She will greet you with a big grin and make sure you have a great chiropractic experience! She will take your call or schedule your appointment. She is a Registered Chiropractic Assistant and also performs ultrasound and electrical stimulation therapy. Hailey is our administrative intern. She is a Registered Chiropractic Assistant. She handles patient flow and answering the phones in our Fort Myers chiropractic office. Hailey can often be found scheduling at the front desk, assisting with school physicals or performing ultrasound and electrical stimulation therapies. 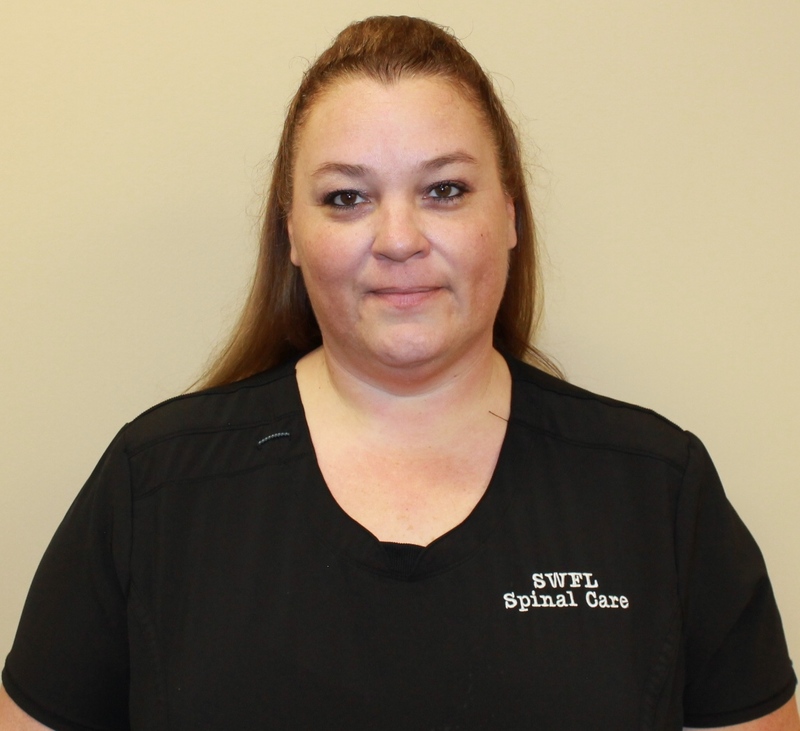 She is a great addition to our SWFL Spinal Care team! Carmen is a Licensed Massage Therapist and a Registered Chiropractic Assistant in our Fort Myers chiropractic office. She offers 30 and 60 and 90 minute massage sessions 5 days per week. She may perform your physiotherapy as well. Carmen methodically applies focused, hands-on techniques to promote relaxation and increase circulation in the body’s soft tissues (muscles, tendons, connective tissue, etc.). Call to check availability and schedule your relaxing massage today.